Premium Indigo Blue 100% cotton adult tees. The newest and most exciting Big Boy t-shirt in years can now be yours. 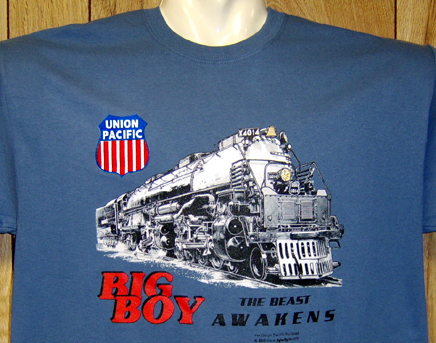 Show your appreciation of the Union Pacific Railroads continued support of its heritage and to American Railfans by wearing this great new Indigo Blue 4014 Big Boy Tee. 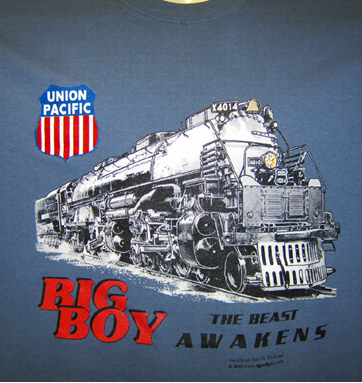 The most famous steam locomotives of all time, Union Pacific BIG BOYs... 4014 will soon be burnishing the mighty rails of the UP Railroad as restoration of the beast is under way in Cheyenne, Whoming. Design so authentic you just might feel a rumble in your shirt. Feel the Heat! Click on above image for zoom.